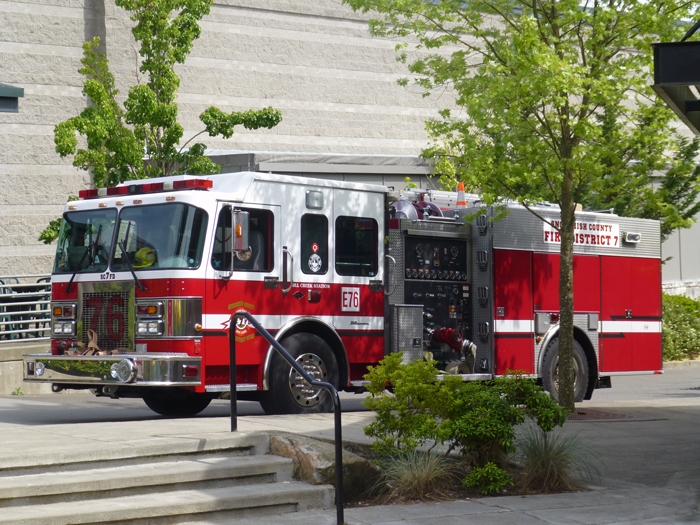 Snohomish County Fire District 7 responded to 417 calls from November 26th to December 9th, 2018, with 79 of the calls being in Mill Creek. Crews were dispatched at 1:47 p.m. to a reported single car roll over at the 21000 block of SR 2 near Gold Bar. Upon arrival Engine 31 found a single occupant ambulatory on the side of the road. Crews blocked one lane of SR 2 for safety while treating the patient. The patient was evaluated and transported to Evergreen – Monroe by aid unit. At 2:01 p.m. firefighters were dispatched to a reported commercial fire at the 21800 block of 49th Ave SE. Crews arrived on scene and found smoke showing from the eaves of a one story cabinet shop. Firefighters pulled a hose line for fire control and to conduct the primary search of the structure. They were able to quickly contain and extinguish the fire. The owner of the shop tried to extinguish the flames before firefighters arrived. He was evaluated for smoke inhalation but was not transported to the hospital. No injuries were sustained. The Fire Marshal was requested for investigating the cause of the fire. At 2:36 p.m. crews were dispatched to a high speed head-on motor vehicle collision at 13400 block of SR 522. When crews arrived they found one vehicle resting on the passenger side with significant damage with the driver trapped inside. The second vehicle came to a stop on the shoulder and had significant front end damage as well. Multiple bystanders and two off duty firefighters were already on scene helping when crews arrived. Crews worked quickly to assess and treat patient injuries, and extricate one patient from a vehicle. One patient was transported to Evergreen – Monroe by aid unit, while the other patient was transported code to Harborview Medical Center with significant injuries. SR 522 was closed for a long period of time for WSP to investigate the collision. Fire District 7 was dispatched at 10:32 a.m. to a three car motor vehicle collision at the intersection of 108th Street SE and 25th Drive SE. When crews arrived they found one vehicle still blocking traffic and the patient still inside the vehicle. For scene safety they continued to block traffic with the ladder truck and started patient care. One patient was transported to Providence – Everett by aid unit. With the temperatures dipping low lately, Fire District 7 wanted to remind citizens how to stay warm and be fire safe! Does your fire place have a metal screen or a heat-tempered glass secured to the front of the fireplace? If you have a space heater, remember to plug it directly into an outlet, not into an extension cord. Also, remind children to stay at least three feet away from the fireplace or space heaters. Lastly, make sure you have tested your smoke and carbon monoxide alarms.